Google Analytics is the ultimate tool if you want to get some trustworthy statistics about the hits on your website. 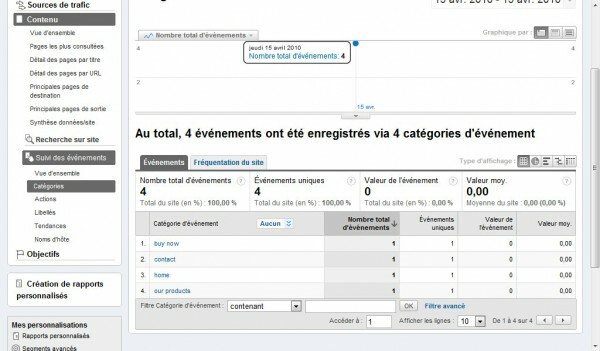 It will easily give you statistics about your visitors, about the sources of traffic to your site and about pageviews. This is fairly useful if you want general information about who comes to your site and what pages are viewed most. Another useful tool is the event tracker which is accessible under Menu Content / Event Tracker. In order to finalize your Google Analytics Account, you need to copy-paste Google tracking code snippet to the bottom of your pages (just before the </body> tag). You’ll have to replace the account ID (UA-XXXXX-X) by your own. This code snippet will work as well as the old one and will not wait for the end of the script to be loaded since it’s in the <head> of the document. You can browse the data per categories, per actions or per labels. This entry was posted in JQuery and tagged event tracker, Google analytics, JQuery by admin. Bookmark the permalink.